I have a problem with Salmonella spp.detection. I use your Anti- Salmonella I (A-E+Vi) serum. Colonies on specific media are specific to Salmonella, all biochemical test are also specific, but serum gives me a negative reaction. nice practical research.and can you show me the basic difference&similarity between s.typhi and s.tyhpimurium ????? 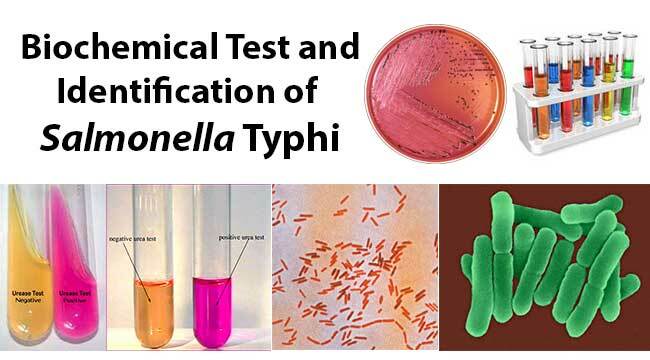 Typhimurium is positive for citrate test typhi is negative. Other than that they are different in the diseases they produce with typhi producing typhoid fever and typhimurium most types of food poisoning from salmonella in poultry etc. nice performing but i am confusing that it is same for all Salmonella serovars….! Are S.typhi citrate negative??? U have written negative.. but in Annanthanarayan it is written positive for all salmonella species. Could anyone tell me which one is correct? All salmonella species are positive to citrate utilisation test, except salmonella typhi which is negative. good research and clear guideline. you have given detail identification parameters for salmonella serovars especially salmonella typhi. I did it in the near past. particularly non-typhoidal serovars.